The unveiling of the foundation stone for the new Molecular Imaging Research Centre at Castle Hill Hospital in February this year. A charity which has turned Hull, East Yorkshire and North Lincolnshire into a UK-leading region for the detection of cancer, heart disease and dementia is urging funders to act quickly and take advantage of a scheme which will double their donations. The Daisy Appeal has signed up to The Big Give Christmas Challenge, which is the UK’s biggest online match funding campaign. For seven days it offers supporters of participating charities the opportunity to have their donation doubled on theBigGive.org.uk. But time is running out – the window closes at midday on Tuesday 4 December. Since the Big Give launched the campaign in 2008, the Christmas Challenge has raised over £90 million for thousands of charity projects. 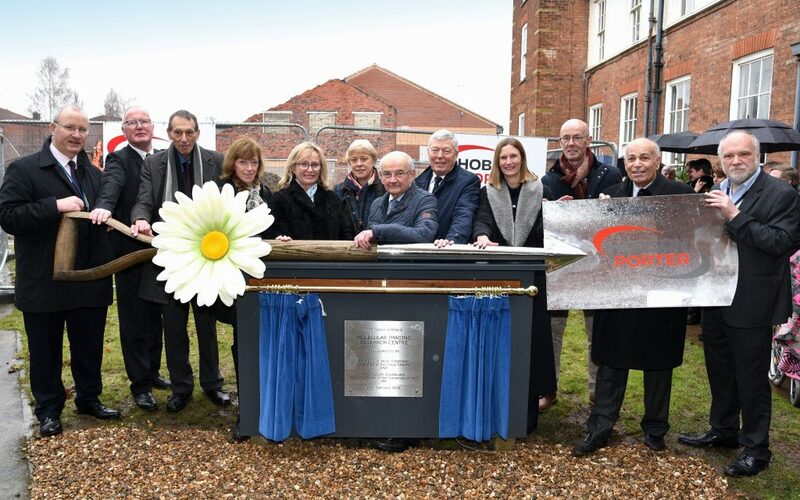 The Daisy Appeal, which has already raised millions of pounds to fund cutting-edge research and state-of-the-art equipment and facilities, is now working to bring in more money to build and equip a radiochemistry and cyclotron unit at Castle Hill Hospital, Cottingham, which will serve people throughout Hull, East Yorkshire and North Lincolnshire. Cancer is a leading cause of death in the area as is heart disease. Dementia is an increasingly common disease with sufferers and their families having to face the consequences every day of their lives. The total project cost is £2.1-million and work is already under way, with the foundation plaque for the Molecular Imaging Research Centre having been unveiled earlier this year. Daisy Appeal trustees hope that people planning to make donations in the near future can double the value of their contributions by striking before the deadline. 1 Comment on "Daisy Appeal in race against time to double its donations"